As you all know by now, I like charts. They tell stories. (apologies for Google's misplacing of UK's label - should be between Germany & Italy). What this chart tells us is that unemployment in Europe was FALLING, generally, until 2008. Since then it has risen sharply and continues to rise in all these countries except Germany. This chart tells two stories. The first is the effect of the Euro in synchronising growth among Eurozone countries. The synchronicity is striking - the UK, which is not a member of the Euro, stands out like a sore thumb. This chart suggests that the Eurozone countries are coupled closely together and an adverse shock in one is likely to have serious consequences for the rest - as we are seeing at the moment. The second story that this chart tells is related to my first chart. All the Eurozone countries in this chart were growing at a similar pace - until 2008. The UK's collapse starts earlier, but the rate of collapse steepens in 2008. And NONE of these countries - not even the mighty Germany - has yet recovered. In most of them, GDP is still falling (note that the scale of this graph means that the catastrophic collapses of Ireland and Greece don't show up clearly as their economies are much smaller than the rest). Note the spike in Germany's debt caused by its support of other Eurozone countries, notably Greece. The first is absolute government spending, and the second is government spending versus GDP. I know you've seen these charts before, but I've included them in this short summary because they complete the story. Note the sustained upward trend in absolute government spending, in contrast to the SUDDEN rise in government spending versus GDP in 2008 and, in most countries, the slight fall since. If you compare this chart to the GDP chart you will see that the rise and fall of this graph is caused mainly by changes in GDP. I've analysed these movements in more detail in this post. There is a constant theme throughout this post, isn't there? The European economic landscape changed fundamentally in 2008. Since then unemployment has risen, GDP has fallen, government debt has risen - in some cases almost sufficiently to bankrupt the country - and government spending has risen. What happened in 2008 was not a sovereign debt crisis. Nor was it a currency crisis. It was a banking collapse. That collapse forced private debts onto sovereign balance sheets. It caused the deepest recession since the 1930s. It caused job losses and wage cuts across Europe, leading to increases in benefits bills and consequent rises in government spending. It caused economic stagnation as banks cut back lending, restricting the business finance essential to economic growth. And what is STILL GOING ON in Europe is a banking collapse. The banking collapse of 2008 has not ended. We have not repaired our broken financial system. We are still terrified of the consequences of bank failure. We are sacrificing the future of an entire generation to prop up insolvent financial institutions and a failed currency experiment. WE ARE STILL BAILING OUT BANKS. The latest is Bankia. It will not be the last. The problem with continent-wide 'grands projets' is their inability to react to events. Well illustrated here. Result as usual: continent-wide train wreck. Lessons learned: as usual, nil. Be careful about drawing too much from the GDP chart - the units are USD so the biggest factor affecting the year on year growth rates in recent years is the exchange rate in USD - for example in 2009 the chart above makes it look like the UK's economy contracted 18% rather than 5%. True. But the distortionary effect of translation to USD occurs across all the countries. The problem with both charts is that sterling devalued by about 25% in the second half of 2008. I mentioned this in the post where I used the GDP chart in Euros but not in this post. However, you've misread the chart. 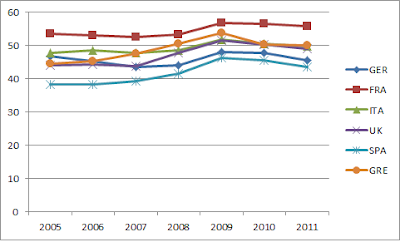 It actually shows the steep contraction happening in 2008. This is undoubtedly partly due to the sterling devaluation. 2009 shows a slight recovery.